There are several reasons why you want to change a grass lawn to rocks. It may be purely for aesthetic reasons; you may prefer the look of gravel over grass. You may want a lower maintenance yard that requires less water. Or, you may be dealing with a disease, insect, drought or flood situation. 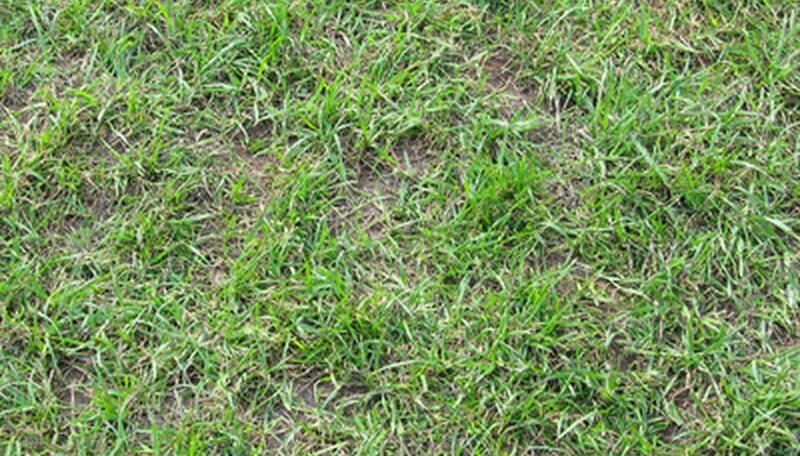 Once grass is affected by an infestation, it may never recover. To repair the landscape, you can replace the grass with some sort of rock. It takes some work but if you set aside a weekend for the project, you will be happy with the results. Eliminate small areas of lawn with a sod cutter. It has a long handle with a small platform at the base. There is a blade on the underside of the platform. Step on the platform to make the blade cut into the grass. Slice into all unwanted areas to loosen the grass. Pick up the pieces with a hoe or flat shovel. Put the grass in a compost pile or roll it up and replant it somewhere else on your property. Rent a gas-powered sod cutter to tackle large lawns. Run the machine down the length of th grass you want to remove. Make a second path 2 feet from the first one, in a parallel direction. Roll up the sod to use it somewhere else or dispose of it. Kill stubborn grass with a weed killer. The herbicide will attack the plant by the roots. Rake up the dead grass once the chemical has had time to work. Lay down a sheet of black plastic for a less labor-intensive method of killing the grass. Leave it in place for at least 1 week. Remove the dead grass with a rake. Choose a stone to lay down. They vary in color and size. River rock comes in 1/2 to 1 inch and 1 to 1 1/2 inch size. It is available in shades of brown, gray or tan but can be difficult to talk on. Pea gravel is smaller, about 1/4 inch in size. It is gray in color and easy to walk on. However, it can be moved by heavy rainfall. Chips of marble measures about 1 inch. They are white. Another choice is lava rock, which is black or maroon and measures 1 inch. Measure the planting area. Mulitple the length by the width to come up with the square footage. Use this number to determine how much rock to buy. In general, 1 ton of rock will cover 100 square feet, 2 inches deep. Transport the rock to the yard with a wheelbarrow. Spread it with the pitchfork or shovel. Wear gloves as protection when changing a grass lawn to rocks.